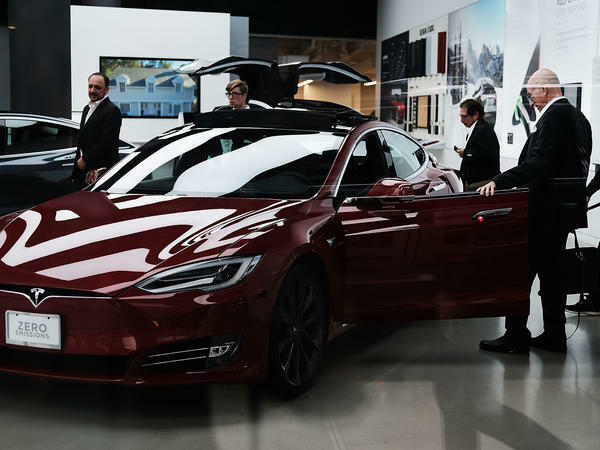 People look at cars at a Tesla showroom in New York City. Tesla CEO Elon Musk, reportedly under scrutiny by federal regulators for earlier statements, says Saudi Arabia's sovereign wealth fund is looking to diversify away from oil with a bigger investment in the electric car company. Musk is reportedly under scrutiny by federal securities regulators for this tweet as well as earlier statements. Now he is explaining that Saudi Arabia's sovereign wealth fund could help him take the electric car company private. He said in a Tesla blog post on Monday that the Saudi fund has purchased almost 5 percent of Tesla stock and that, for nearly 2 years, the fund has approached him "multiple times about taking Tesla private." "They first met with me at the beginning of 2017 to express this interest because of the important need to diversify away from oil," he said. "Obviously, the Saudi sovereign fund has more than enough capital needed to execute on such a transaction," Musk said. He added that he's continuing to have discussions with the fund and "with a number of other investors." But he offered no evidence in the blog post that he had secured full funding to take Tesla private. Musk's statements about taking Tesla private have drawn scrutiny from the Securities and Exchange Commission, according to published reports. Regulators want to know whether Musk was truthful when he tweeted that he had secured funding for such a deal. "Under U.S. law, companies and corporate officers can't give shareholders misleading information about meaningful company events," The Wall Street Journal reported. "Mr. Musk also could be in trouble if regulators develop evidence that he made a statement aimed at goosing his company's share price." Tesla's stock closed at $379.57, or up nearly 11 percent, on Aug. 7, the day Musk announced his plans. Since then, the stock has fallen and closed at $356.41 Monday, down about 0.3 percent. Musk has said that having Tesla as a private company would be less distracting that the "enormous pressure" of meeting quarterly financial targets. In the latest blog post, he dismissed reports that Tesla would need to raise more than $70 billion to take the company private, saying such estimates "dramatically overstate the actual capital" required. "The $420 buyout price would only be used for Tesla shareholders who do not remain with our company if it is private," Musk wrote. "My best estimate right now is that approximately two-thirds of shares owned by all current investors would roll over into a private Tesla." James McRitchie, an activist investor, has his doubts. "Elon Musk assumes two-thirds of the shares owned by current investors would roll over into a private Tesla," he tweeted. "That's quite an assumption. And 'funding secured' is quite speculative." Musk said he will continue to talk with investors, adding, "I have engaged advisors to investigate a range of potential structures and options."